The future location of Amanecer Breakfast Tacos, 512 Main St. Amanecer co-founder Ana Vela said she hopes to open the new shop by early August. 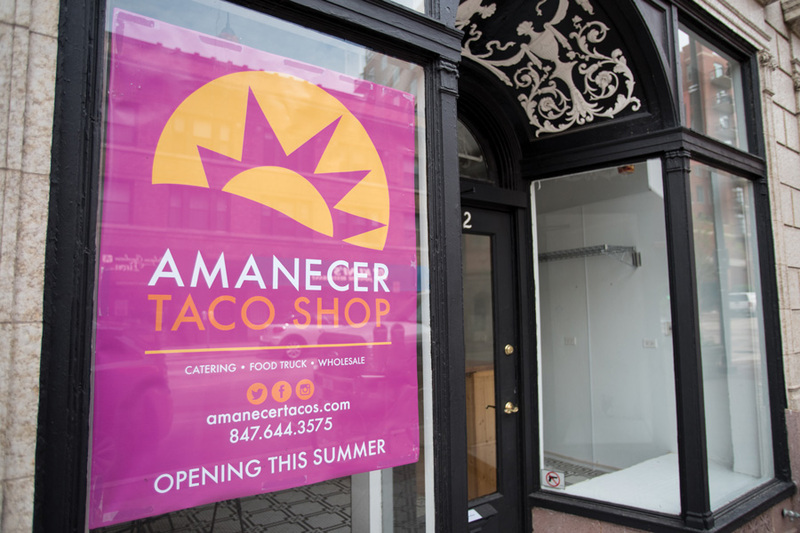 After serving food out of a Smart Car for two years, Amanecer Breakfast Tacos plans to expand into a permanent storefront in central Evanston this summer. Amanecer co-founder Ana Vela said she hopes to open the new taco shop at 512 Main St. by early August. Vela said it would be open from 7 a.m. to 2 or 3 p.m at first. When Vela and her husband Mario Vela — director of employer relations for Northwestern’s Kellogg School of Management — moved to Evanston from San Antonio, Texas, seven years ago, the first thing they noticed about Chicago was the lack of breakfast tacos. Vela said she and her husband were “fixated” on the idea of bringing breakfast tacos to Chicago and ended up launching their business, Amanecer, two years ago. Though Vela had never worked in the food industry before — her background is in product development and educational publishing — she said her experience with marketing and branding has been crucial to Amanecer. Vela said she treated the first 18 months as “market research,” listening to feedback from customers and establishing connections with other local businesses. Because Vela used her own money to invest in the business, she said she wanted to “start slow” — operating out of a commercial kitchen with 20 other food startups. To further save on costs, Amanecer serves food out of a Smart Car. After concluding her market research, Vela said she was confident she had developed a profitable business model. Loyal customers like Amy Sanchez (SESP ’15), a research project coordinator at Northwestern’s Institute for Policy Research, have said they’ve wanted a permanent shop for a while now. She added she hopes the city “gets on board” with the breakfast taco trend. Evanston’s economic development manager Paul Zalmezak said the Main Street location is “probably the smallest spot in Evanston,” which he said provides a “neat link” to Amanecer’s small food truck. Zalmezak said Amanecer will be important for commuters on the Main Street corridor in the mornings. Vela said she hopes to extend the shop’s hours once they settle in to serve a late night crowd on weekends. She said she will also look to partner with Sketchbook Brewing Company to do an “exclusive taco run” between the bar and her shop. “We have a really great, diverse community here, especially with Northwestern — our product is very unique in Evanston,” she said.